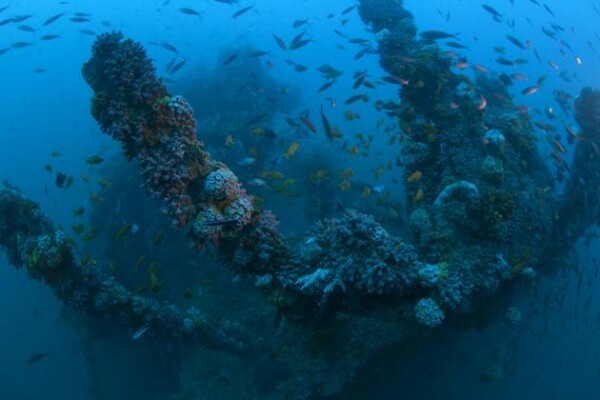 Thirty km south-west of Colombo port, the S.S Worcestershire lies some 60 m deep. It is one of an estimated 200 wrecks that garland the island of Sri Lanka. Fascinated by its history, eager to rise to the challenge of a technical dive, Dharshana Jayawardena would later recall his descent to the ship: “As always, a first glimpse of a deep ship is bone-chilling thrilling. As narcosis envelops your senses what seems to be a large and hazy shadow slowly develops details. Then, at 50 meters we are at the ship and in a strange, deep, lush paradise seen by few.” Dharshana found the WWI wreck enveloped by shoals of fish — grey snappers, yellow fin trevally, giant trevally and groupers swirling around it. Multiple dives, the discovery of an old chamber pot bearing the legend ‘Bibby Line’ plus key measurements of the ship’s carcass and location allowed Dharshana to identify the S.S Worcestershire as the vessel that went down in 1917 while en route from Rangoon to London. That such discoveries are still waiting to be made is one of the pleasures of wreck-diving in Sri Lanka, but there are many others. “Wrecks are like an oasis in a desert,” says marine biologist and diver Nishan Perera, explaining that here you can see marine life in extraordinary numbers. The S.S Worcestershire is one of a dozen wrecks sunk around Colombo. A Japanese fighter plane was once spotted but has proved impossible to locate. Newer wrecks offer their own surprises. For instance, visitors to the Car Wreck will find spare parts of cars strewn around the massive carrier. However, the monsoons dictate when divers can go looking for these — the season on the west coast of the island will kick off in late October-November, and continue till early April before switching to the east coast. While locations like Hikkaduwa and Trincomalee have gained fame, Colombo is actually one of the least well known, yet most promising destinations for divers on the island. “What makes Colombo stand out is the quality of the shipwrecks — most of which are intact — and the super marine life,” says Dharshana. Environmental scientist and underwater photographer Naren Gunasekera of Island Scuba (http://islandscuba.net/) agrees: “It’s one of Sri Lanka’s hidden secrets,” he says. Naren does 80 per cent of his dives here, in his backyard as it were, heading out from Mt. Lavinia beach along the fringes of the city. His company frequently hosts divers from abroad, some of whom never venture much further than the dive site before flying back home. 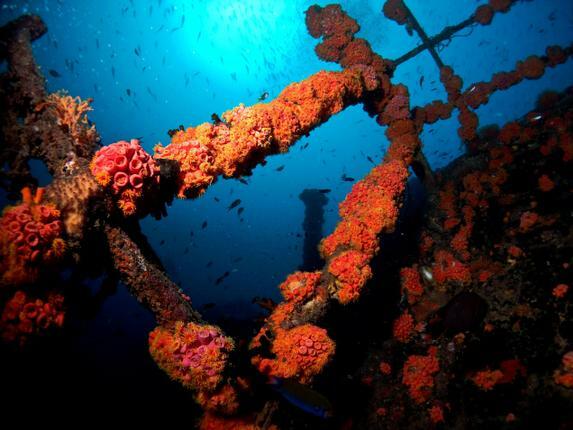 Many come looking for sea life, which exists in abundance around wrecks like the Colombo Cargo Wreck (seven km west of the city and lying 30m deep, it allows divers to see schools of fish, stingrays, large groupers and, on occasion, eagle rays, dolphins and whale sharks) and the Medhufaru. The latter rises from a depth of 30m to 15m making it a very popular site for divers at all levels. Here, Dharshana says marine life abounds, and sightings have included lionfish, scorpion fish, eagle rays, huge shoals of baitfish and honeycomb moray. 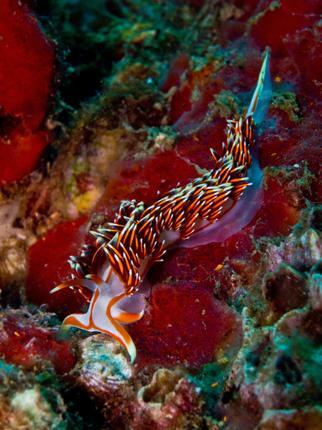 It’s where Naren counts on seeing the most nudibranch. The latter are also known as sea slugs, a name that does little justice to their entrancing colours and startlingly beautiful forms. As Nishan will tell you, encountering animals in the ocean is quite unlike any experience you might have on land. “To me, the appeal of diving is that the connection you make with the wildlife and the elements is far greater. You can’t walk up to a lion on the Serengeti or a leopard in Yala, but you can get so close to the shark.” Immersed in water, a diver also experiences an alien environment intimately: “You feel the current as a vibration, changes in visibility and temperature affect you — you’re just more connected,” he says. Some divers, however, have a different focus. Dharshana used to take pictures of marine life before he became fascinated with the history of the wrecks themselves. “Finally that story has become more important,” he confesses. (His book on Sri Lanka’s wrecks — many of which are catalogued on his site www.divesrilanka.com — will soon be released.) History buffs like Dharshana find plenty to fascinate them in local waters but the H.M.S Hermes, which sank off Batticaloa in 1942, is particularly noteworthy. The world’s first purpose-built aircraft carrier, the Hermes was taken down in a dramatic attack by Japanese fighter planes and has been included on lists of the top 100 dives in the world. Lying 53m deep, it requires explorers be expert technical divers. 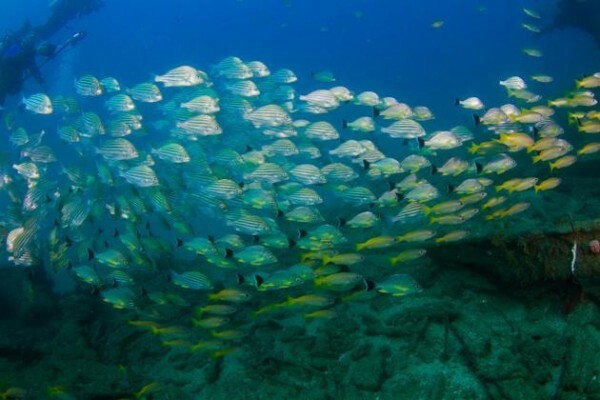 But they’re rewarded by an intact, upturned wreck complete with guns, and a reef of black coral, rampant with marine life that includes large tuna, shoals of snapper, barracuda and trevally. While some of these deeper wrecks require advanced qualifications, you could be ready to dive a shallow wreck in a week or less. A basic certification costing an estimated $450 and 3-4 days of your time will equip you to dive to 18m. Another $50 on a Deep Adventure Dive course and you’d be able to access 90 per cent of the wrecks around Sri Lanka. You’ll want a qualified diver to accompany you till you gain experience, but it’s quite safe, Naren assures me. Rules that prohibit divers from actually venturing into the wrecks where they risk being trapped or blinded by silt contribute to the local industry’s good safety record. The wrecks have more to offer than their first appeal for tourists. As Sri Lanka’s beleaguered corals struggle to survive the pummelling of pollution, sedimentation, irresponsible tourism and climate change, these wrecks are increasingly irreplaceable — most critically for the fishing community. (Plus, fishermen are forced to embrace the more sustainable line fishing technique over nets that could get tangled on the wreck’s sharp edges.) Local communities see their importance more often than not, and they’re the first to protest when salvagers come calling. While Sri Lanka’s National Aquatic Resources Agency (NARA) has been struggling to catalogue and protect the wrecks, it’s an uphill task, and implementation remains a challenge. Where countries like the Maldives actually sink ships to create wrecks, local conservationists worry that enough isn’t being done to protect Sri Lanka’s rich underwater heritage. “The value of the wrecks is immense, people think it’s just a pile of metal, but they’re so much more,” says Nishan. Pointing out that the significance of the shipwrecks in terms of both the environment and tourism rises incrementally with every year that goes by, Naren says: “It would be wonderful if there was some formal recognition of these sites as having historical value.